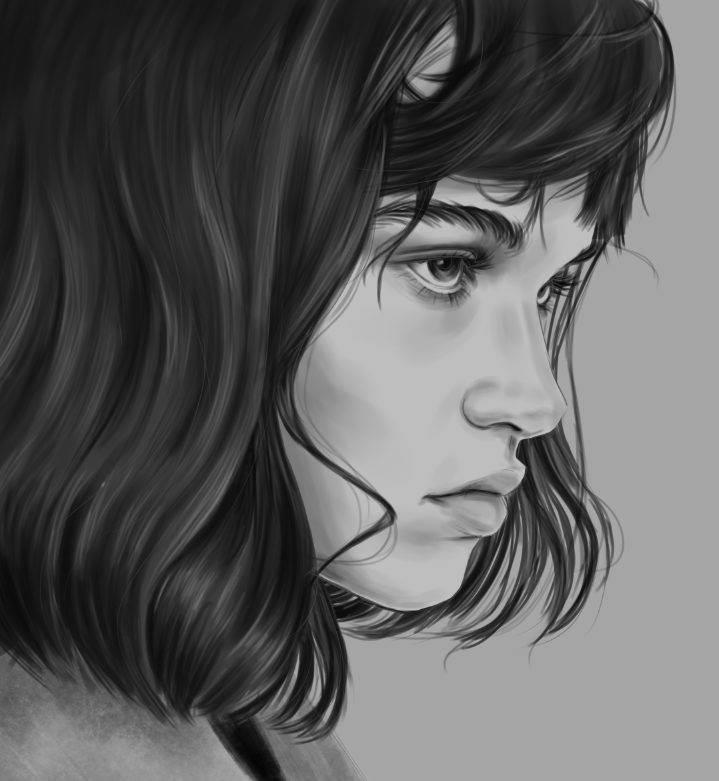 In this tutorial, we’ll show you how to quickly render your own digital portraits in monochrome using easy to learn techniques. 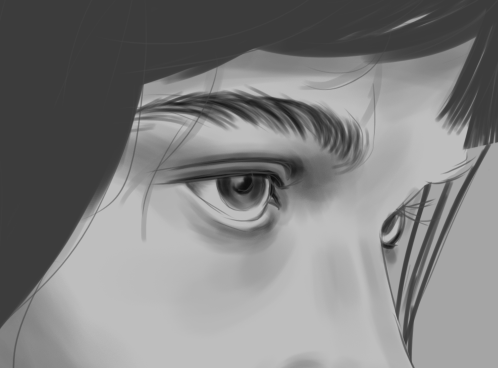 We’ll start by working with layers, building up tone, highlights and textures to create depth and detail for illustrating eyes, hair, face, and skin. We used a reference from Pinterest. 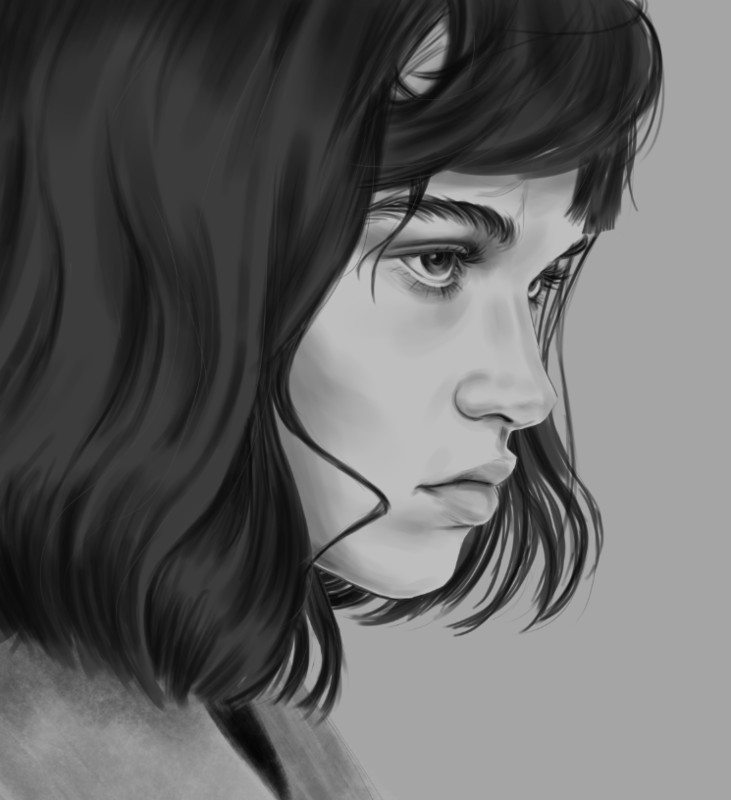 Starting out with a chosen reference photo (references are a great resource, don’t be afraid to use them), place it onto your canvas in Photoshop. For digital work canvases of 3000px by 3000px and 300dpi are good to work on as they allow good quality printing. Images can be sized down afterward to suit the situation. 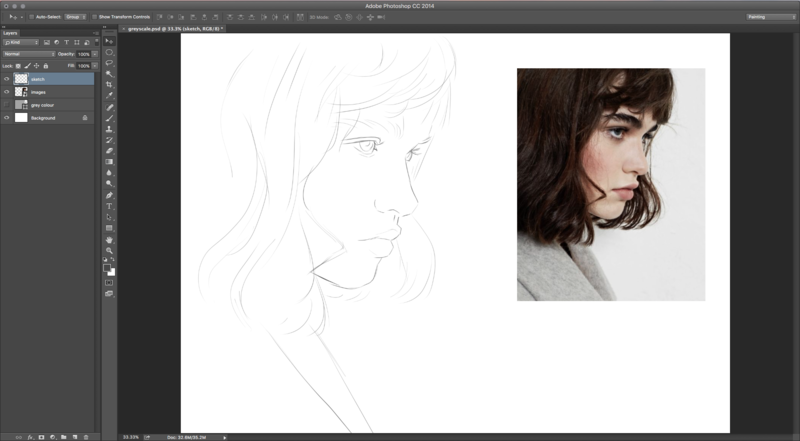 On the ‘sketch’ layer (which should be the topmost layer) sketch out the desired outline of your reference. This can be as stylised or as realistic as you like depending on your own personal style. A hard-edged brush is excellent for this, however, you can use any brush you like as long as it gives you a clear line to work with. 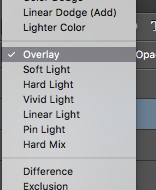 Be sure to label your Layers appropriately to avoid mistakes. We will be working under the sketch layer until the desired amount of color is built up and then moving above it, so remember to name the layers clearly. Above the background layer, create a new layer and put down a neutral grey background. This will help make the highlights we apply later to ‘pop’ and will make blending darker colors easier. 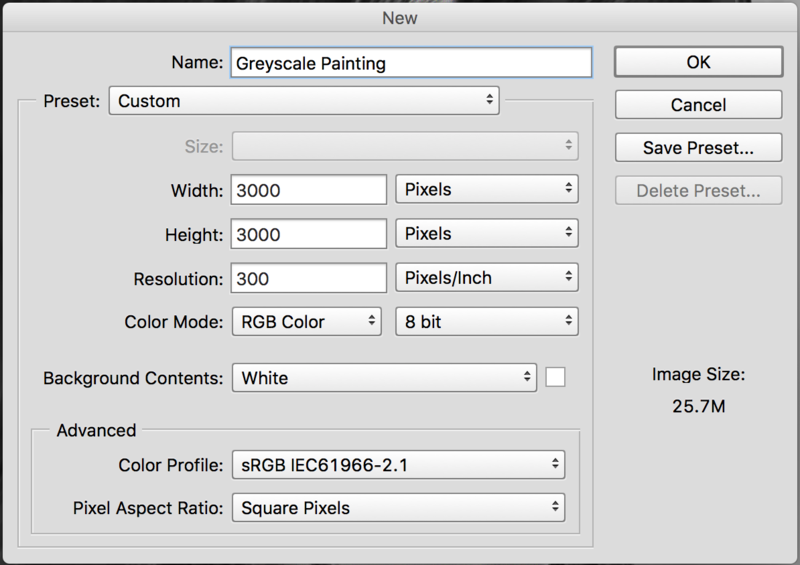 At this point, you may also want to change your reference image to black and white, which will allow you to color grab the right shades to blend with or you can use the image as a value guide, like we do in this tutorial. Next, apply the base colors to the drawing, under the ‘sketch’ layer, so the lines lay on top of the colors, allowing the lines to be visible as we work. To select the right skin and hair colors, pick out the mid tones of each so highlights and lowlights will create dimension. In a separate layer, on top of the face color layer, add the hair. We create new layers so we can erase and add in more detail without disturbing other aspects of the painting. 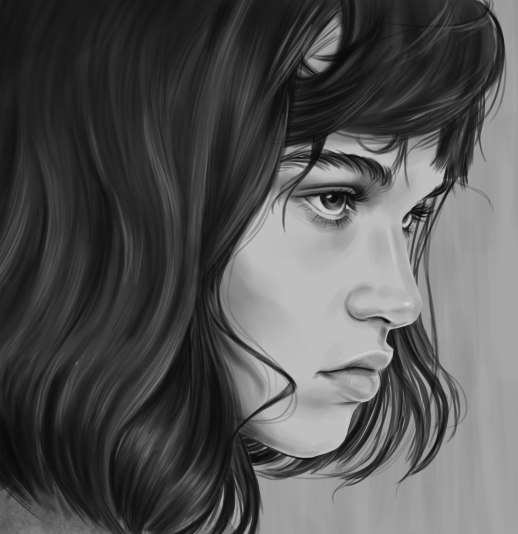 To start the rendering portion of the portrait, use a soft-edged brush (you can find a good one on Photoshop for free, the one used in this tutorial is from Kyle T. Webster. 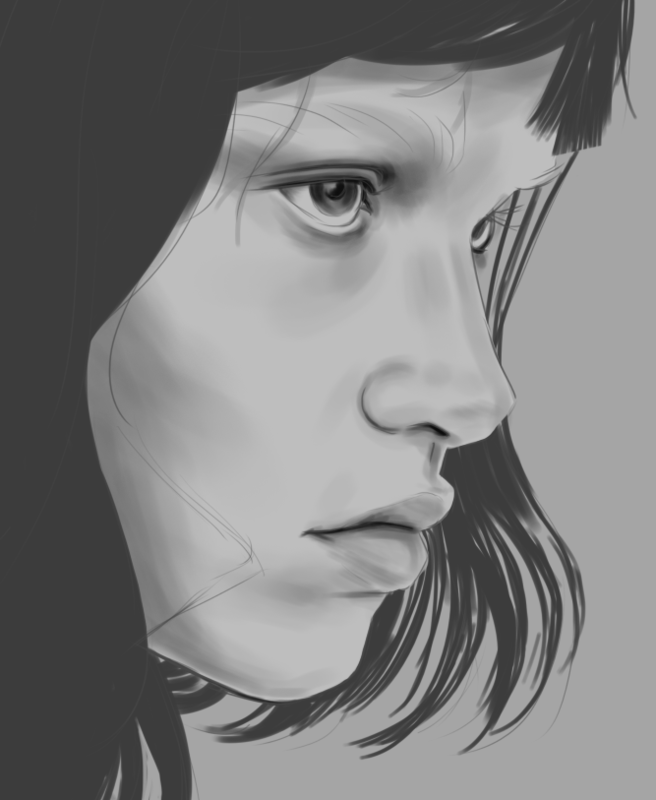 Using a slightly darker grey, softly darken the more prominent shadows of the face. Remember you can follow your reference literally or use it as inspiration. Keep the pressure light if your tablet pen is sensitive. This is only the first wash of grey, details will come later. Keep the brush size big. The shading will look streaky if it’s too small and muddy if the brush is too fat. Knowing what size is best is down to practice. Try out different sizes and textures to find one that works for you and your style. 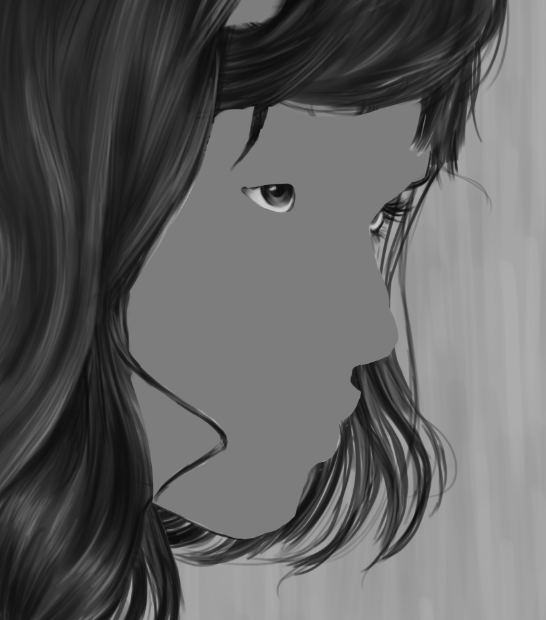 Once you have the face shadows and contours mapped out, you can progress to a fractionally darker grey. Pacing yourself with saturation will allow a nicer blend of color. 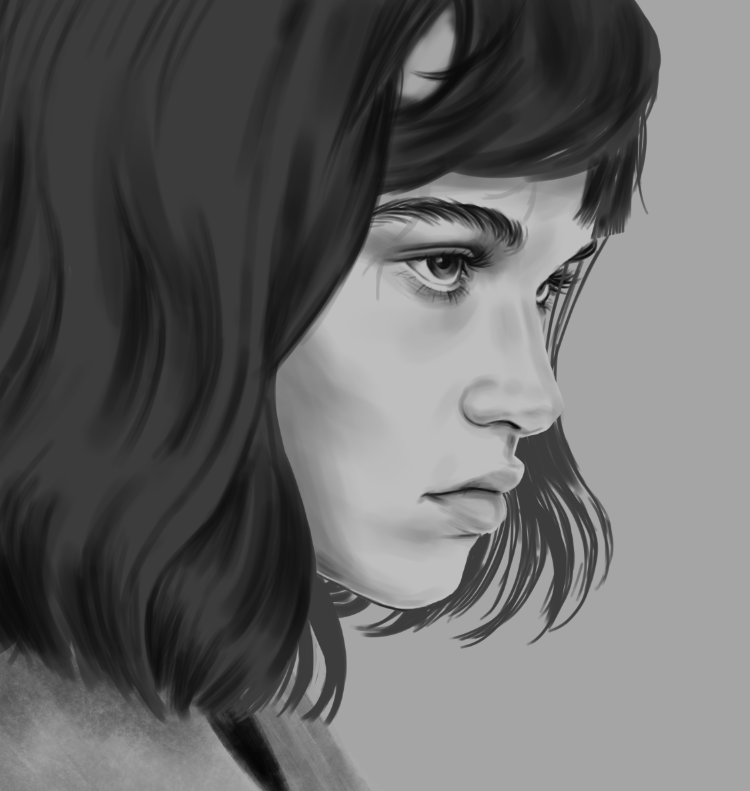 As you block in shadows, you can get darker with your greys, or apply more pressure to your tablet pen. Begin mapping in the darker shadows, the almost black areas, so you can judge the strength of the line you use. 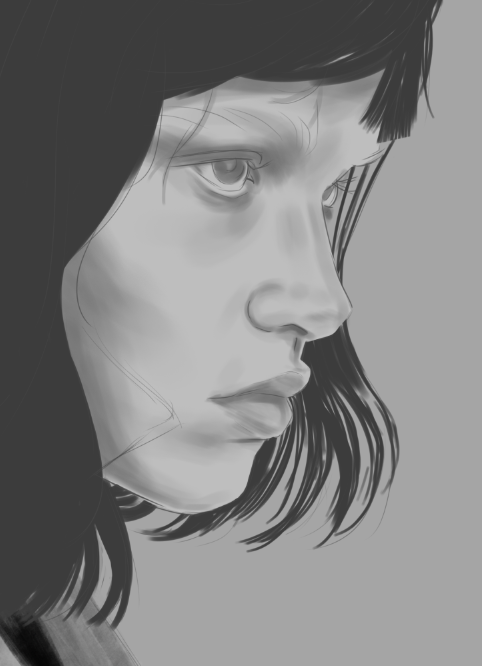 Using a grey that still not quite black, detail the eyes, lash lines, nostrils and lips. These are usually the darkest parts of the face, depending on the lighting. Since we shaded the entire face first, the intense lines won’t be as brash and will blend into the skin better. 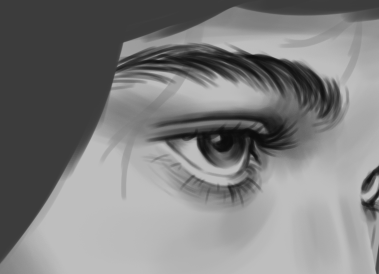 You can begin to sketch in the brow shape and color at this point. Brows are, realistically, made up of small hairs, not one block of color, and so can be drawn in hair by hair. 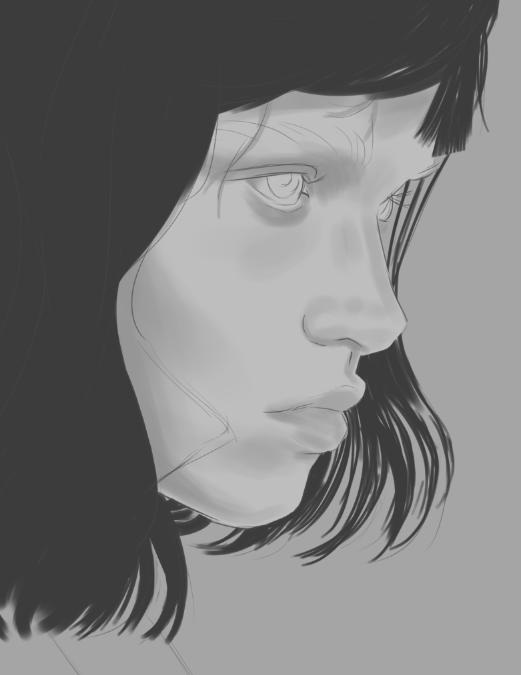 Using varying hues and pressure of your tablet pen, sketch in the hairs. Once you’ve reached this point and are happy with it, most of the base color and details have been applied to your portrait. It is now ‘safe’ to hide your ‘sketch’ layer, working on top of the previous layers we’ve used. 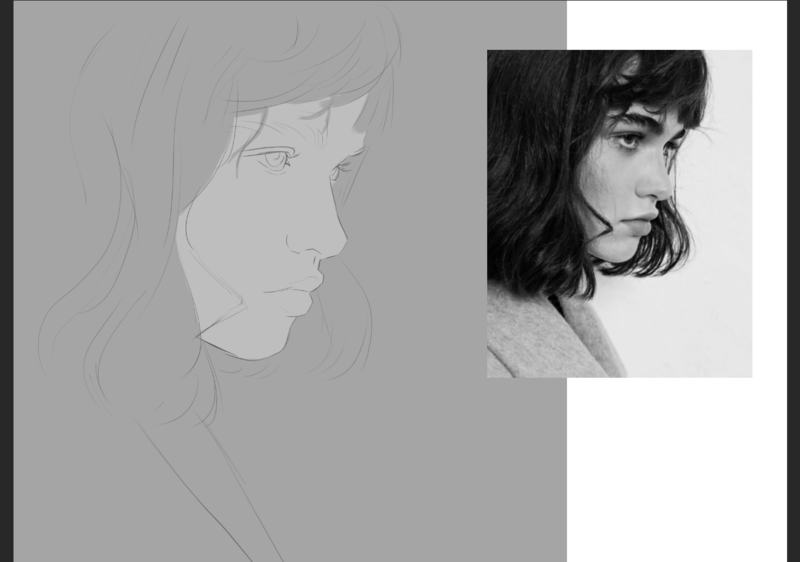 Having a slightly darker background than the skin tone also now helps distinguish the two with the ‘sketch’ layer is disabled. Moving onto the hair, create a new layer and move it to the very top of the layer window. Using the same color as you used for the lashes, begin to sculpt the darkest parts of the hair. Add in more darker values, creating shape to the hair and also dark shadows around the forehead and sides of the face to create volume and dimension. Draw in the smaller strands of hair and wisps. 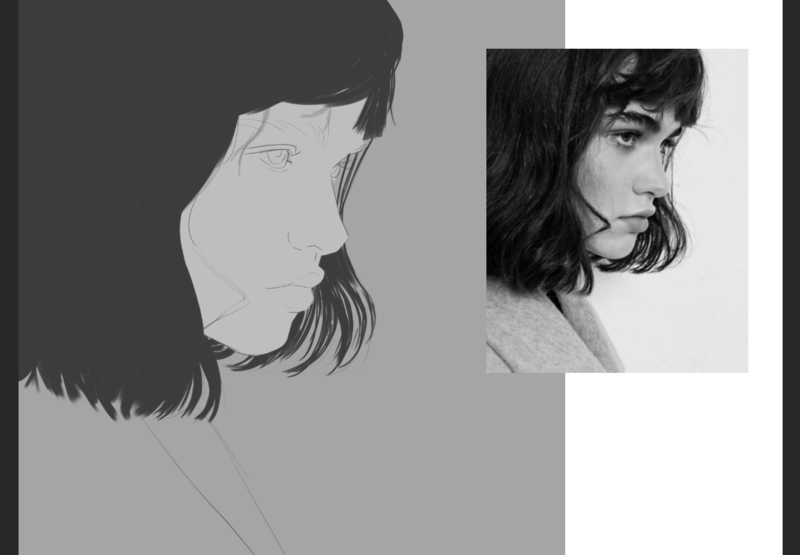 This will break up the shapes within the portrait and make it more believable and natural. Using a lighter grey than the bulk of the hair (or the skin midtone) highlight the hair. 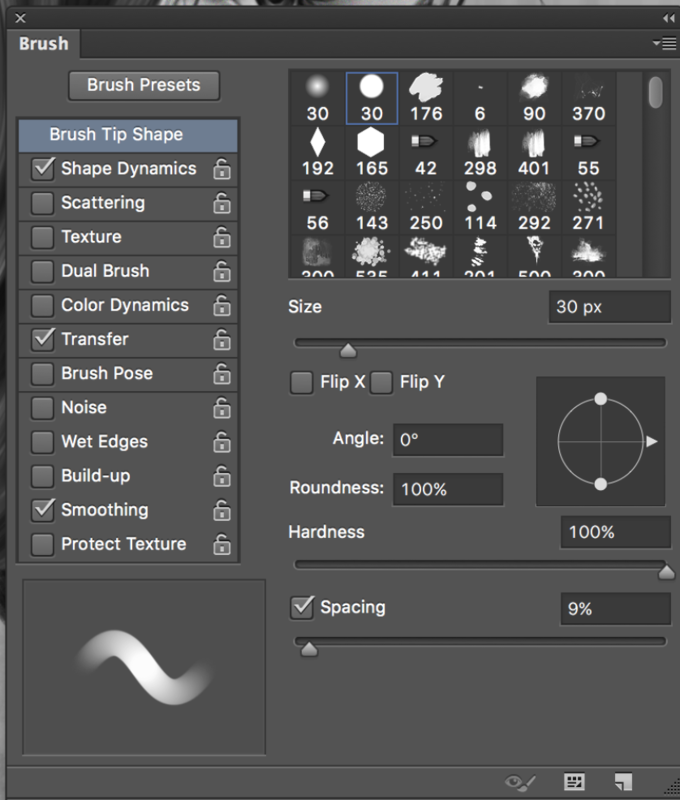 This should be a subtle action with soft strokes, use light pressure or opacity. Apply the highlights to the curl of the hair. 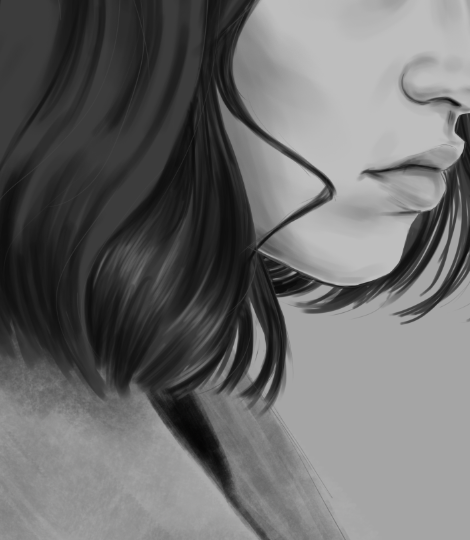 Look at plenty reference images to see learn how to draw hair in detail. The highlights will look slightly random and un-uniformed. Hair is never completely perfect. There will always be more prominent strands than others. Continue to highlight the hair and fringe, remembering that there won’t be highlights near the back of the head (in the case specifically). Shade in more shadows around the hair, under the strands and fridge, to intensify the shadows and light. Also add in more face highlights, specifically the nose, cupid’s bow, water lines and inner eye corners. Once you’re happy with your portrait, it is important to re-evaluate. Adding texture the skin can bring more interest and take away the ‘flatness’ of the painting which can often happen. 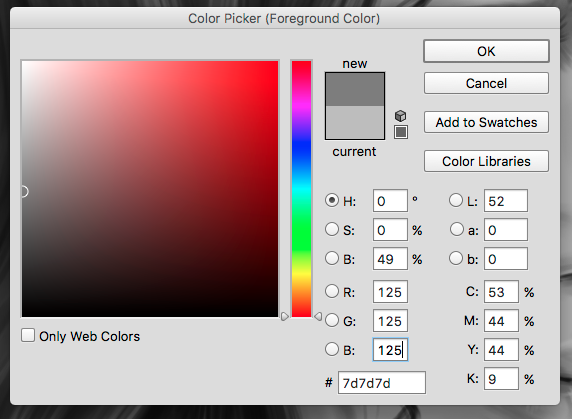 Using the color picker on the RGB mode, input 125 for R, G and B settings to select a neutral grey color for this technique. In a new layer, placed at the top of the layer window, color only where the skin is invisible, making sure to erase over the hair. 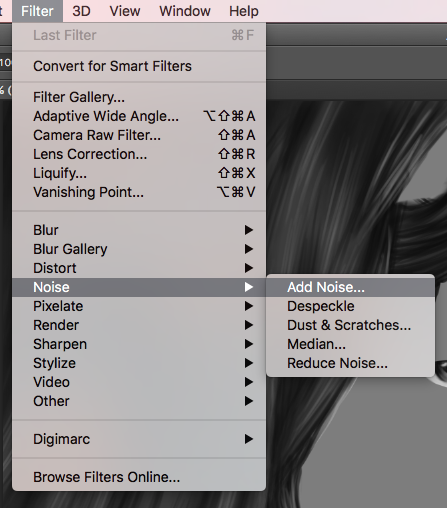 Go to the ‘Filter’ button on the toolbar, selecting the Noise feature and Add Noise. Use the slider to select 110% – 120% and Uniform distribution. You can play around with these settings to alter the effect. These settings are what has worked best in this particular case. 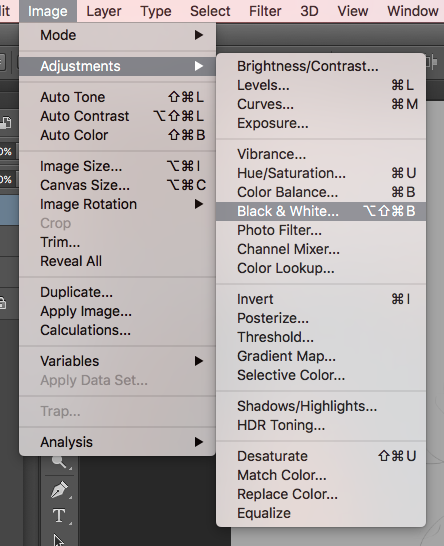 Turn the opacity of the layer down to 20% – 25% and select the Overlay option. The new effect will be barely noticeable but very effective for the overall look of the portrait. 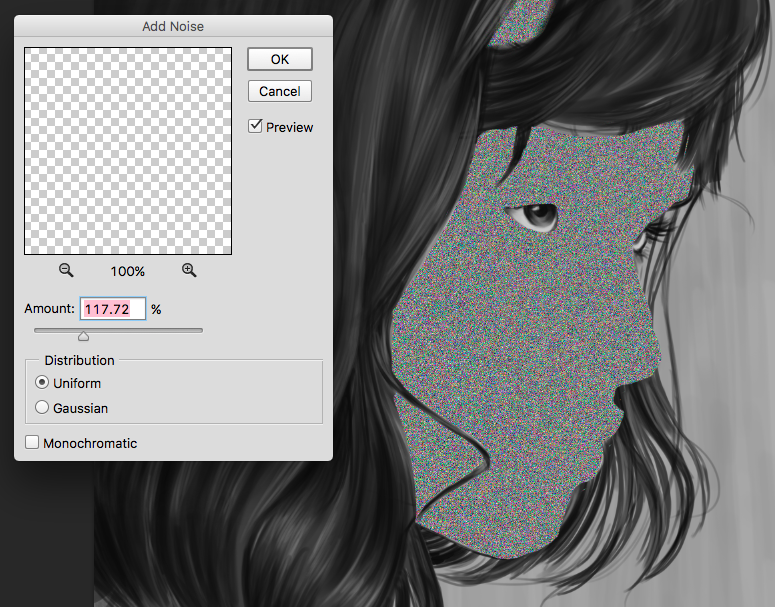 You’ve now created a beautiful greyscale portrait of your own! You’ve learned how to sketch out the figure, shade the face, render hair and create believable skin texture – all in different values. 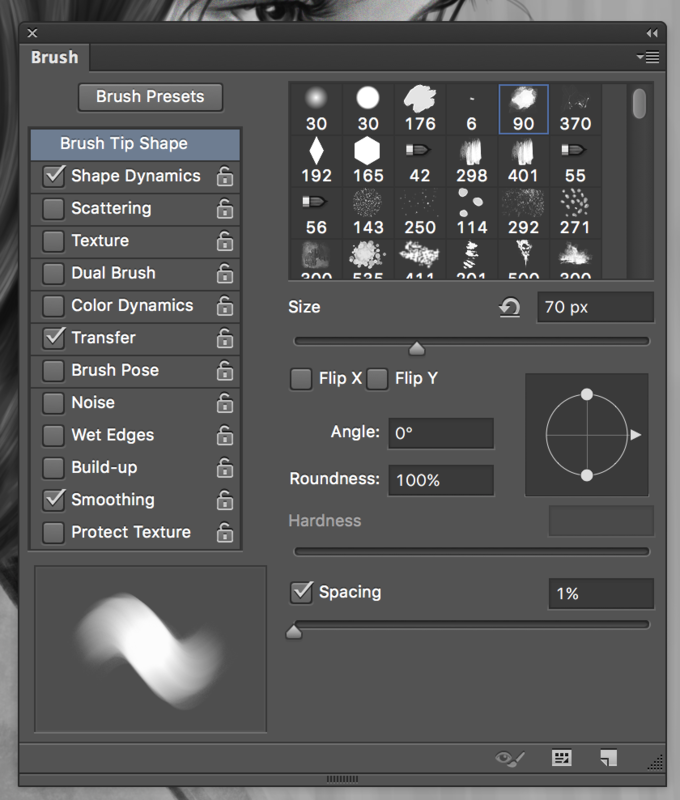 Some artists like to work completely in greyscale to get the values correct and then color on top using the Overlay or Multiply layer functions. Much like the way oil painters work with glazes. 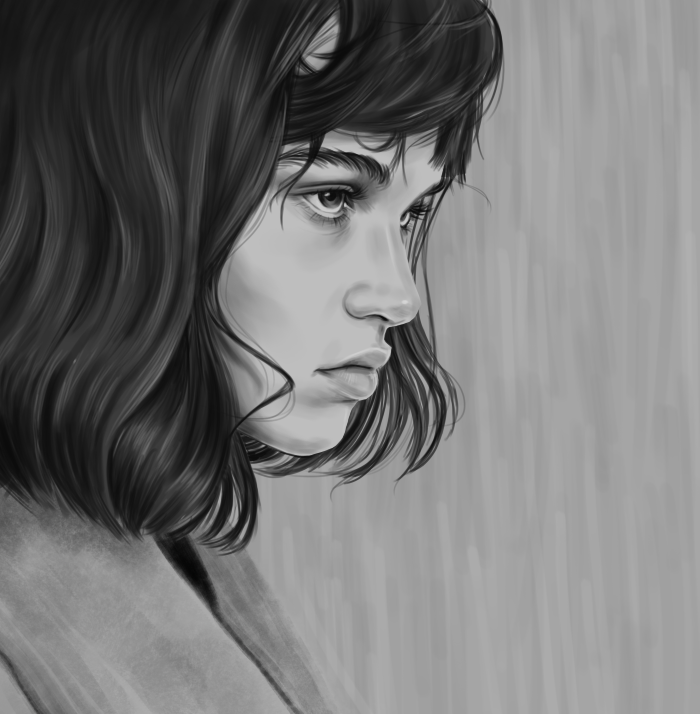 If you enjoyed learning how to digitally paint in greyscale, explore more of our creative tutorials!